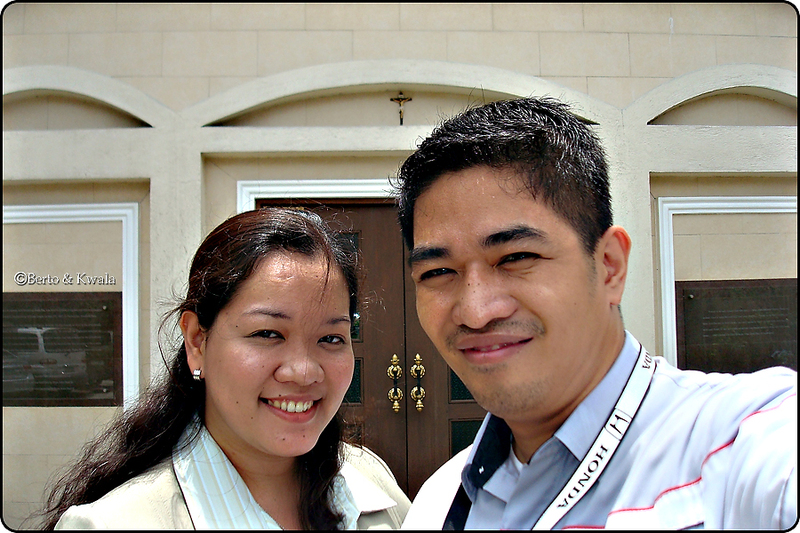 When we were still working, I would often visit hubby at work in Libis and we would park the car at the nearby pay-parking space within the grounds of St. Pio Chapel. I would usually look at the chapel from the outside wondering what it looks like on the inside. I was always intrigued but never had the chance to to take a peek. After years of just passing by the chapel, we finally got the chance. To be honest, I didn't really know St. Pio except that he was a capuchin mystic and that he bore the wounds of Jesus Christ or stigmata. Also, early this year, they exhumed his body from his grave to find that it has not been corrupted even after so many years have passed. a true sign of a saint! Upon entering, I found the chapel very cozy. It is small and airconditioned, and you can tell that it is properly maintained. it is designed like the one in San Giovanni Rotondo. Its facade is shaped like the Cross. It helped that we went on a weekday, so there were hardly any visitors then. When we got in the chapel, it was so quiet and solemn. And when we approached his statue, I actually got goose bumps... His statue was so lifelike. There was a pew set up in front of st. Pio's statue so that you can look at him as you kneel and pray and write down your petition on the papers provided. 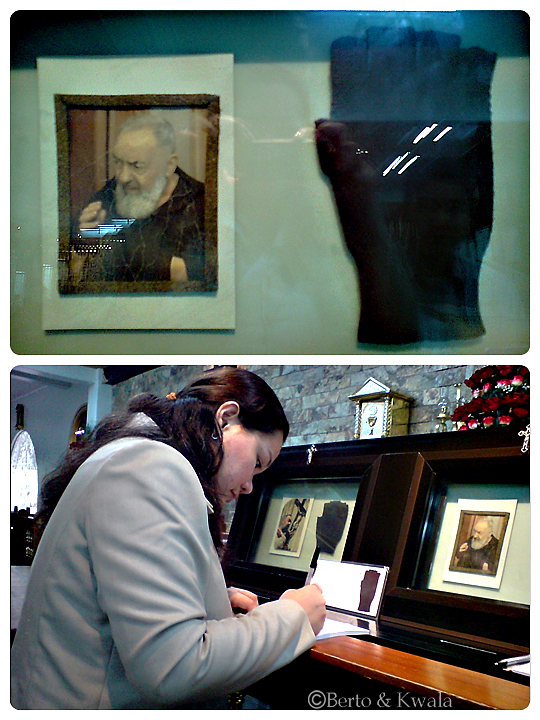 They also had the prayers for St. Pio ready for the devotees, with a replica(?) of his gloves framed, available to be touched by the devotees. When st. Pio was still alive, he would wear gloves as he said mass so as to not frighten the people of his fresh wounds on the palms of his hands. Since these gloves were in direct contact with his hands and his blood, they were preserved and are said to have since became instruments to many miracles. The walls of the chapel are adorned with numerous testimonials by Filipinos healed through the intercession of St. Pio. From addiction, to cancer, to dengue... there was even a testimony coming from a childless couple who were finally blessed with a child after becoming devotees of St. Pio. The chapel is maintained by businessman Ramon Escobar Rodriguez and his wife Didi Cloribel Rodriguez on their property at 188 E. Rodriguez Ave., Bagumbayan, Quezon City. They were also recipients of God's grace through a miracle. It all began when Ramon Rodriguez experienced St. Padre Pio’s miracle in 1979. At that time, Ramon was not an active churchgoer, even when he suffered high blood pressure of 240/130 that caused blindness in his right eye and blurred vision in his left, he didn’t go down on his knees to pray for help. A friend then gave him a novena to Padre Pio, out of curiosity, he picked up the novena and wondered whom Padre Pio was. Unconsciously he was reading the novena and wondered why he was able to read it. When he went to his ophthalmologist and he was told that he was cured. He could already see clearly. Right then and there, Ramon promised Padre Pio that he would pray his novena everyday and that he would venerate Padre Pio for the rest of his life. 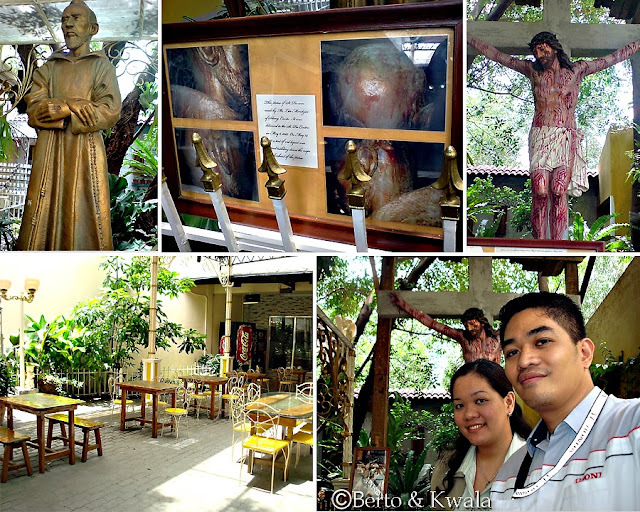 In 1983, Ramon and Didi put up the Philippine Centre of Padre Pio. First, they used a space in their building and converted it into a chapel. Now the chapel has grown on a 2,000 sq m area that included a garden which is called the Padre Alessio Garden. They also had the bloody and realistic crucifix that again gave me the goosebumps, and a statue of St. Pio. It was said that a after the statue was placed there in the chapel garden, red liquid was found to have oozed on his head and nape. They had pictures, but they didn't really claim it was blood. The new chapel was officially blessed on Sept. 23, 2007, the death anniversary of Padre Pio who died on Sept. 23, 1968. Come and visit the chapel and experience it for yourself. * Pictures were taken many many years ago... hence the younger faces hehe. Information is updated though. thanks a lot. and God bless you both.